Most hydrozoans show the same alternation between polyp and medusa phases that the Scyphozoa, or "true" jellyfish, have. A fertilized egg develops into a sessile polyp, which buds asexually and eventually buds off one or more medusae. The medusa produce eggs and sperm, reproduce sexually, and thus the cycle is repeated. The difference between most hydrozoans and most scyphozoans is that in hydrozoans, the polyp stage usually predominates, with the medusa small or sometimes absent. Often, the medusa never breaks away from the parent polyp, and remains in a state of arrested development, although its gametes function. Such a medusa is referred to as a sporosarc. In scyphozoans, the medusa stage is typically large and free-living, with the polyp stage small. However, there are exceptions  certain hydrozoans known as the Trachylina never form a polyp stage. Free-living medusoid hydrozoans can be hard to tell from scyphozoans, but hydrozoan medusae generally have a muscular shelf, or velum, projecting inward from the margin of the bell. This structure is not found in scyphozoans. Hydrozoans also lack cells in the mesoglea, the jelly layer found between the basic cell layers, whereas scyphozoans contain amoeboid cells in the mesoglea. Another feature that is quite common in Hydrozoa but not typical of Scyphozoa is colonial organization. While a few hydrozoans, such as Hydra, are solitary polyps, most live in colonies made up of anywhere from a few to thousands of individual polyps. Colonies may secrete extensive calcium carbonate skeletons (coenosteum) or be covered with a flexible chitinous exoskeleton (perisarc). In colonial hydroids, the individual polyps, or zooids, are differentiated for different functions: gastrozooids feed, dactylozoids capture prey, and gonozooids give rise to medusoids with gametes. Some colonial hydrozoans are so integrated that they behave like a single animal and are often mistaken for jellyfish. The "by-the-wind-sailors," or chondrophorines, are such colonial hydroids. Even more integrated are the siphonophores, which not only bear feeding and reproductive zooids but often nectophores, or pulsating swimming bells, and/or pneumatophores, or gas-filled floats. Shown above left is a beached siphonophore, Physalia utriculus, known as the "Blue Bottle." 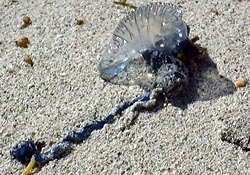 It is a close relative of the "Portuguese man-o'-war" (Physalia physalis); the gas float is at the top, with one long feeding tentacle hanging below.